More than 8,800 plastic drinks bottles were counted across 538 sections of Irish shores this year. Preliminary results of the Coastwatch 2017 survey show 82% of shorelines surveyed had bottles averaging 3.6 per 100 metres. Coastwatch Ireland said that while this was among the lowest in Ireland since 1991, it was still much higher than Scandinavian countries, where the rate is 0.5 per 100 metre. Rope or string was reported on 72% of survey sites. It said 4,867 drinks cans were counted on 68% of units surveyed, with 5,445 bottle lids found on over half of places surveyed. 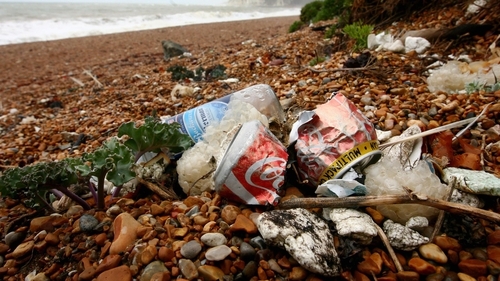 Almost 1,000 plastic shopping bags were counted, representing 40% of places surveyed. Landfill material including construction demolition waste, such as cement metal and asbestos, was also found on 25% of all units surveyed. More than 1,100 tyres were also counted on 24% of all units surveyed.